The old proverb that “Dog is Man’s (and Woman’s) Best Friend” has never been truer. Our dogs have become a key ingredient in today’s family structure and lifestyle. Every family’s lifestyle is different, varying from the pre-planned and organized daily activities, to that of mass confusion, last minute scheduling, everyone going in opposite directions and typically running late. Your dog has adapted to whatever you lifestyle you give it. Better yet, your dog expects to be included, no matter what activities await. Many workplaces now allow you to bring your dog to work with you. Many restaurants and shopping malls now welcome and cater to dog owners and their dogs. There is dog exercise and play parks springing up in every city, many cities having multiple parks. Every day we see people traveling about with their dogs in their vehicles usually serving as their co-pilot, jogging along with their owners, often running beside their owner bicycling or just out taking a casual walk. Have you been to the beach, lake or river lately? Unless restricted by local ordinances, you will find families with dogs everywhere enjoying walks on the beach, chasing Frisbees and balls or running and splashing in the water. 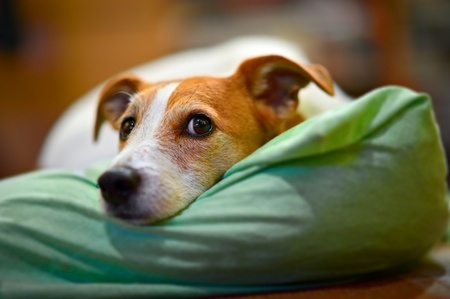 With this evolving lifestyle of having you dog with you all the time, there becomes an increasing need to help protect your furry family member from being injured. Taking nightly walks with your dog has become increasingly hazardous. People driving while talking or texting on their cell phones distracts them from focusing on their driving and the road ahead and can miss someone walking with their dog alongside the roadway. Un-lighted or poorly lit streets also provide additional dangers for both you and your dog during your nightly walks. Our Flashing LED Collar and Leash provides the necessary light to ensure you’re seen. How recently while out driving did you have to slam on your brakes to avoid hitting someone cutting you off or someone merging over into your lane and they didn’t see you or the lane of traffic suddenly stopped in front of you? This dog is securely fastened into the seat. Your seat belt held you firmly and safely in your seat. If you had your dog with you, what happened to your dog? Was he thrown about in the car, landed down in the floor head over heels or are you now sporting fresh toenail skid marks across your car upholstery? Hopefully your dog was not injured. How many times have you or your car seats ended up wearing your favorite beverage because your dog was jumping back and forth from back seat to front seat? A doggie seat belt will keep your dog safe and secure from sudden stops and injuries by being tossed about and also allow you to enjoy your favorite beverage without wearing it. Is your dog protected when out on the boat with you? Has your dog ever jumped out of you boat or jumped off the dock to be with you while you were enjoying a refreshing swim? Dogs have the natural ability to swim. The problem is that not all dogs can swim for the same length of time. Small dogs get tired very quickly. Older dogs and overweight dogs can get into serious trouble very quickly. Even dogs that are in good physical condition are limited to how long they can swim and keep their head above water before becoming exhausted. Canine Care Products the makers of The Snuggy Boots Suspender System – the ultimate in paw and joint protection for you dog is proud to introduce our new line of dog safety products now available for your dog. We offer assorted colored LED lighted dog collars, LED lighted dog harness and Led lighted dog leashes so motorist can now easily spot you and your dog during your evening walks or runs. Car safety for dogs has been a major concern for everyone here at Canine Care Products. There are 2 new products we now offer for car safety. One is a 3-piece seat belt harness, leash and restraint. 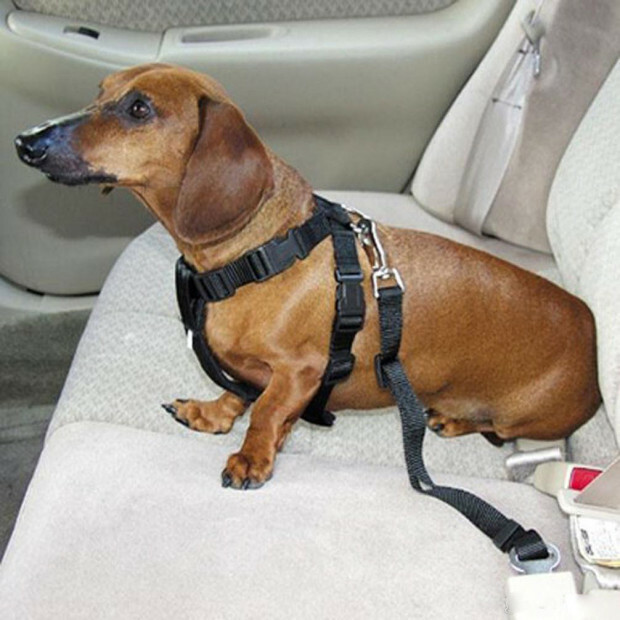 The other is a seat belt strap that clicks into a typical seat belt and then snaps to your dog’s collar or harness. It’s the law that every person on a boat must have a life jacket, but what about your dog? Canine Care Products has the solution. It is our bright reflective Orange dog life safety vest. Available in sizes to fit almost every size dog. This flotation vest is adjustable to fit your dog comfortably, quick release buckle fasteners, front flotation flap to help keep your dog’s head above water and heavy duty handle straps on the top of the vest so you can grab and lift your dog up safely out of the water. Canine Care Products will be adding additional safety accessories to our list of quality products. We also offer fashion accessories for your dog. No dog wardrobe is complete without a Rhinestone collar and Rhinestone matching leash. We have assorted colors and sizes. Now your dog can be stylish when heading out with you for an evening event or simply shopping or visiting friends and relatives. How will you protect your dog?